Easy to make and fun to adapt to your own. Use turkey sausage, or hot sausage and have equally tasty results. Preheat oven to 375f about 20 minutes before you are ready to bake. 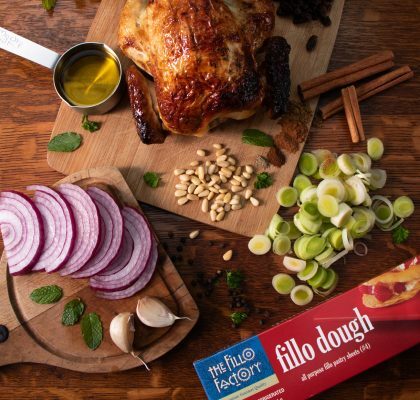 Your fillo dough should be thawed and ready to go. It can be used at room temp or just out of the fridge, but not frozen. If you leave it overnight to thaw in the fridge it should be perfect by now. Begin by frying the sausages in a large frying pan on medium high heat. Don't slice them open just yet. Brown all over and set aside. Then sauté the onions & peppers in the same pan until they are golden brown, stir in the garlic for a few minutes more and take care not to brown it. Add in the tomato paste and stir until it is dissolved. Add the Port or Marsala and stir for a minute until it is reduced a bit by evaporation. Then add in the chopped tomatoes & pepper flakes and bring to a simmer stirring occasionally. Meanwhile trim the sausages by slicing lengthwise, and then cut each long half again down the center lengthwise, so you end up with pieces aprox 1 1/2" long like carrot sticks. Put these into the now simmering sauce and cook for 20-25 minutes uncovered. Adjust salt and pepper to taste. Throw in the basil just as it is done and stir in. Ok now get your fillo out of the box and make strips in the general shape of the ones on the slideshow above. Have a brush with some melted butter ready and brush the top of the strip as shown. Take one piece of sausage and a (drained) dollop of the peppers & onion mixture - placing it as shown at one end. 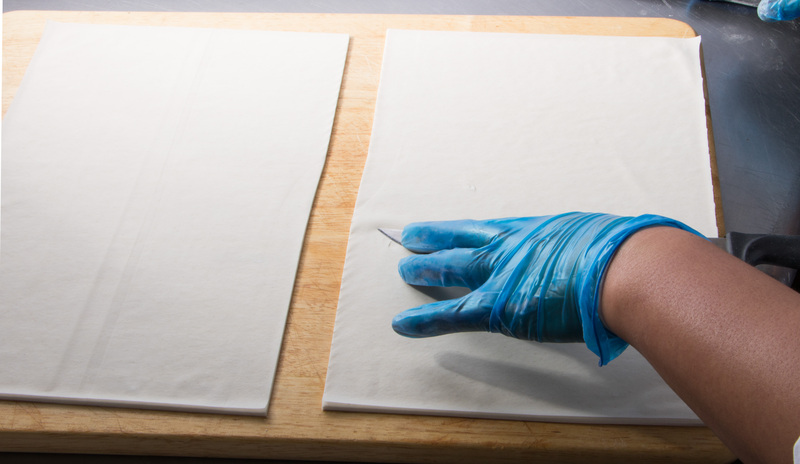 Then fold up the bottom, fold in the sides and begin rolling away from you - place the roll seam side down on a baking pan. Continue this for as many rolls as you want. Bake them at 375 for about 15 minutes or until golden brown on top. You can lightly brush them with butter before placing in the oven for a darker crisper crust. 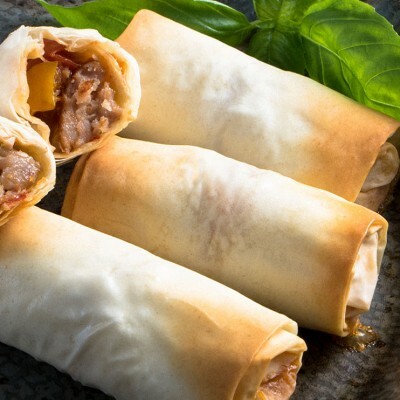 This is the one recipe you should keep on hand for those times you need an easy knock out dish.. Wrap them up into fillo roll-ups and you have a knock-out appetizer for a pot-luck or family party. They will be remembered and requested. 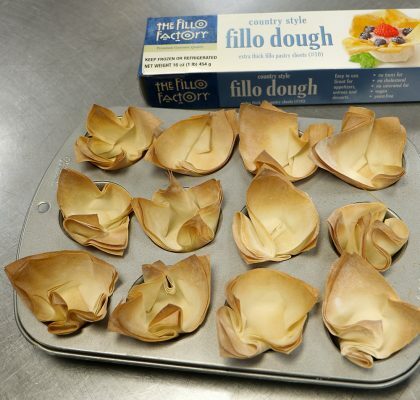 I made these in our test kitchen here at the Fillo Factory. To my delight, they all disappeared shortly after the photo shoot was over. How fast they go is the golden indication of what is a winner, and what is not. And folks, I cook to the crowd. 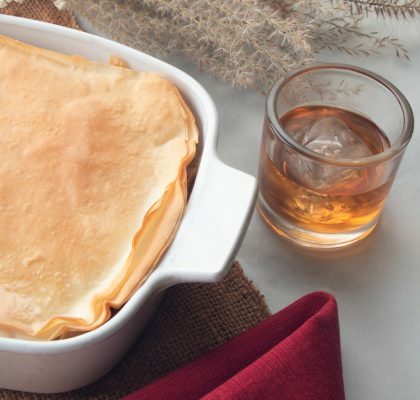 A Chicken Pot Pie to Chase the Chills Away. ← Did Someone say CHOCOLATE?